I have to admit that I’m one of those moms who enjoys playing play dough with my daughter. 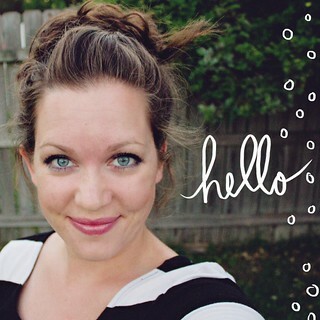 I find it fun and relaxing to sit down and create with it and then smoosh it up and put it away. There’s no agenda, it’s fun to squoosh in between your fingers, and the colors are pretty. Every now and then we also get clay, the more grown up version of play dough. 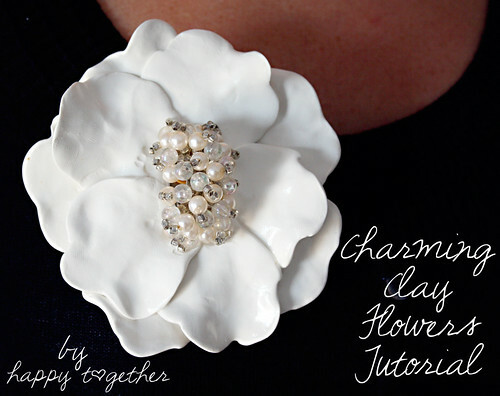 I saw this brooch and flowers on BHLDN and decided to take a trip and buy me and the little one some clay to play around with. Aren’t they just so elegant looking? It makes me want to go find some fancy dress to wear with it. Originally I was just going to make the brooch, but then I had extra leftover and thought a pair of earrings would be lovely as well. Maybe I’ll make a ring or make some for a necklace next? On wax paper, I started off by softening the clay some. The wax paper helps not make your work surface messy and at the end you will just lift it up with the flower and place it into a pan. Then for the brooch, I made ten balls about the size of the end of my thumb. For the earrings I made ten balls as well, but they were a lot smaller. 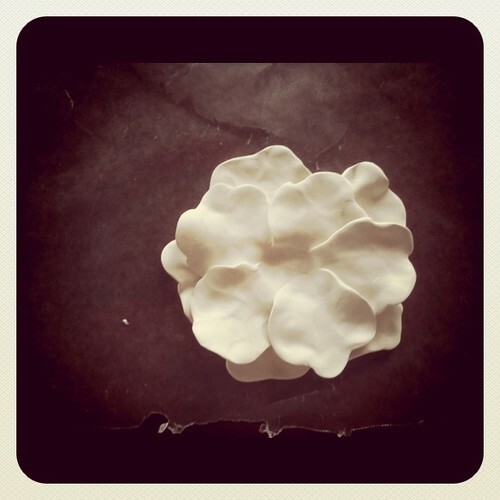 Then I molded each one into a flower petal looking piece. Next, create a ball and squoosh it flat. This will be what you rest all of the petals on. Make sure it is size appropriate. Lay the first layer of five petals down. 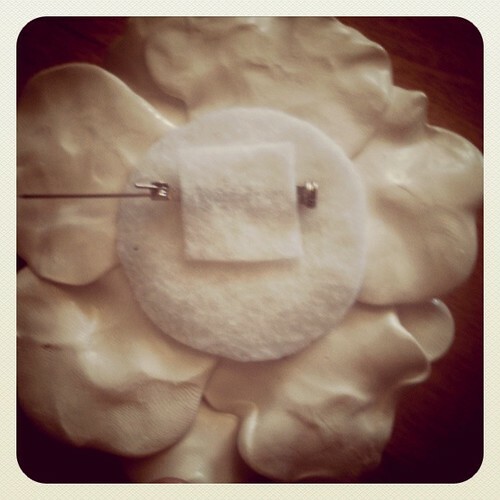 Push down at the middle to squish the petals to the round bottom piece. Then place the second layer of five petals on. I alternated the petals so you could see the edges of both layers. Squoosh the middle of the petals down again to make sure they are secure. 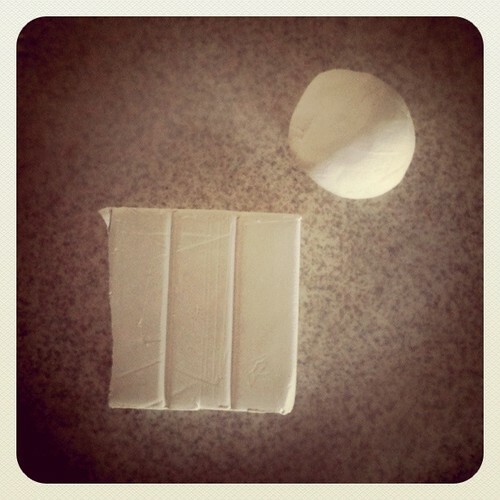 Take the object you are using for the center and press it into the middle to create a mold of where it will go. This makes sure the piece will fit in place after baked. See the earring impression here? 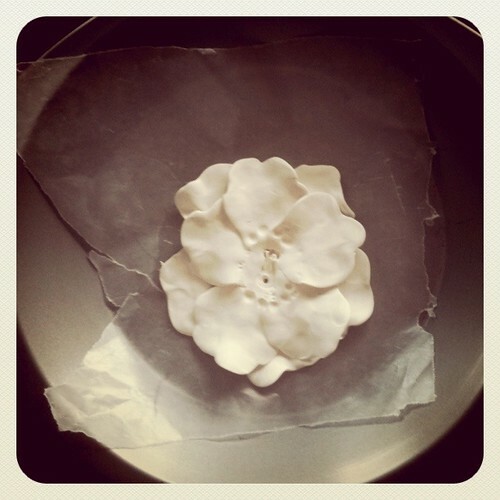 Now lift up your wax paper, with your creation on it, and place it into a baking tray. 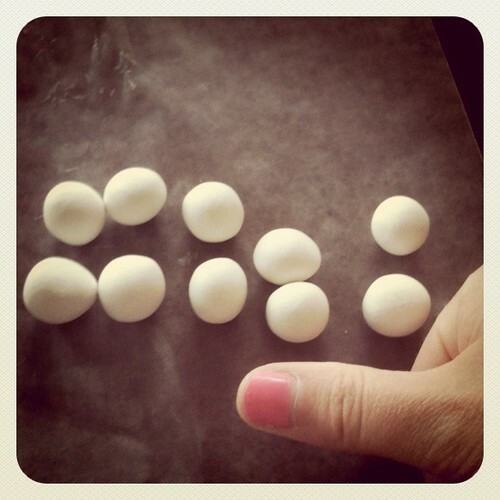 Follow the directions for your clay on how to bake it. Once it is done and cooled off, paint on a coat of the glaze. I did the top, let it dry, then flipped it over and did the underneath of the petals. Then put some glue in the spot where the middle piece will go and place the piece in place. Let dry. Last but not least, add your backing. I used the same glue again to make sure everything stayed in place. 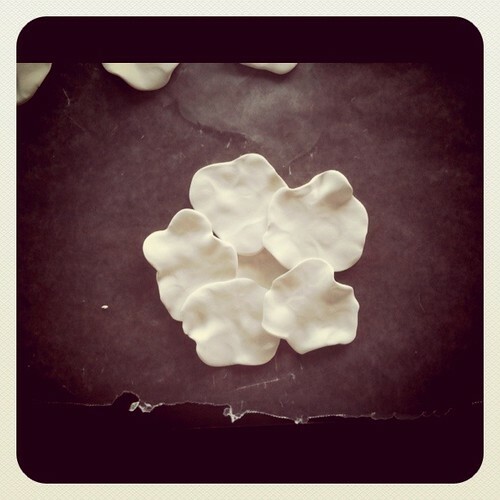 Now you have some charming clay flowers to wear, use for decoration, etc. The sky’s the limit! Cute flowers.. and your baby bump is absolutely adorable. I love what you made!!! thanks for the tutorial!!! Very cool. I’ve been wanting to pull my clay out for a while now (I have a couple of things that I want to make) but baby garments keep getting my fore-most attention. You are looking totally Yummy Mummy by the way!!! Hope you have a great day! OOOoooOOOOOoOoOoO to die for! I love love the,m. This is so getting pinned. Wow this is really well executed, I love the BHNL line and will definately be heading over to Micheals this weekend! I’m going to have to try this. I’ve never done anything with clay before but you make it look so simple. I love the flower earrings. There so cute, are they heavy? very cute! That turned out so cute and looks (almost) easy! I just might have to try my hand at these today… and I agree with everyone else. 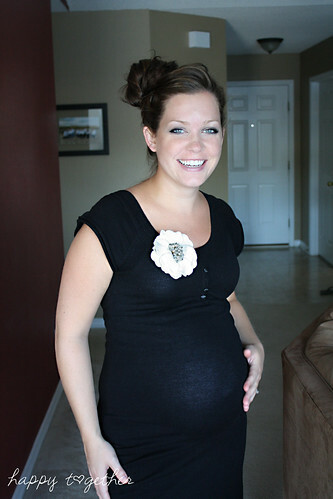 Your baby bump is so adorable! I have earrings a LOT heavier. I don’t think they are heavy at all. 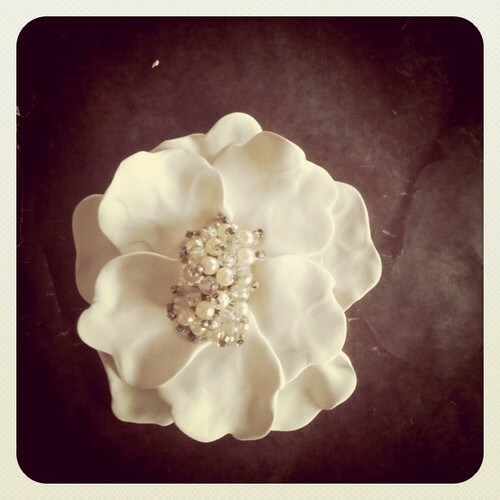 I work in the studio (Paris Inc.) where the BHLDN flower (Hannah’s Brooch)is made. Your rendition is marvelous and just adorable!! That turned out so cute!! What a great idea. Thanks for sharing! wow graet idea thankx for sharing. This is very unique! Thank you for sharing! 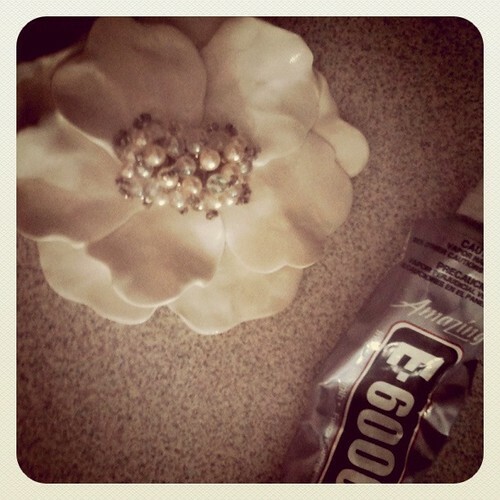 This is just what I’ve been looking for to embellish my Kumihimo necklaces and bracelets. Thanks a lot!!! To make your backs look neater, Try using a hole punch, to punch two holes in the felt the size of your pin back. And just slide the front part through, the back of your pin will be hidden and you won’t have that extra square piece on the front. 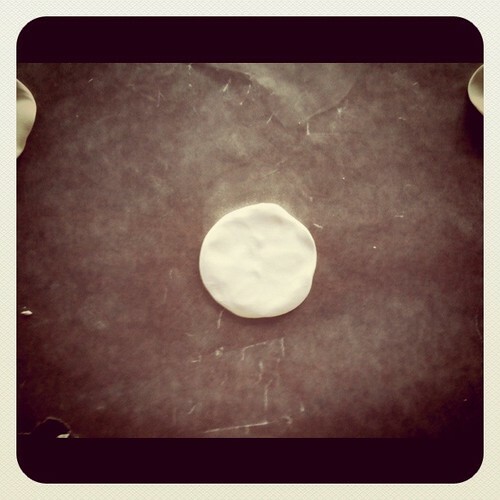 You can also do this with the clay circle and place the pin in it and bake it. It won’t hurt the pin. Your Jewerly is very pretty. Magnifique ! Merci pour ce tuto !! i gotta say- i tried and it was a fail! lol. 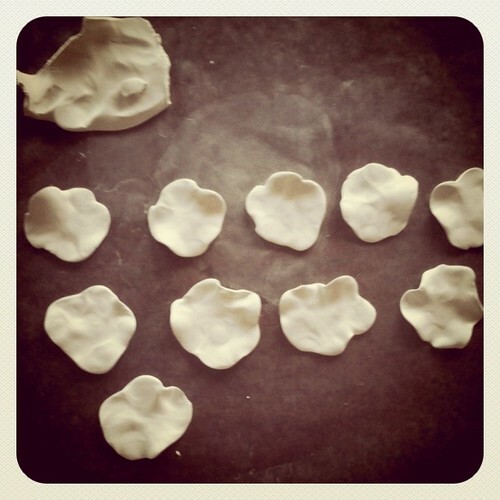 i made all my little balls, flattened them and tried to shape them into petals but i just couldn’t do it. any suggestions? I love this tutorial. It’s AWESOME! The jewelry is so beautiful, unique, and exquisite. My spelling may be bad because I am a kid. Wow, this is beautiful! I have this antique brooch that I’ve been dying to use in a project, I think I have just found it’s destiny! Thank you, I’ve repinned this tutorial! Thanks much for sharing. Appreciated. So creative and beautiful. Thank you for the tutorial. My mom pasted away a few years ago and I have some of her old costume jewelry that I wanted to re-purpose. This is going to be perfect. 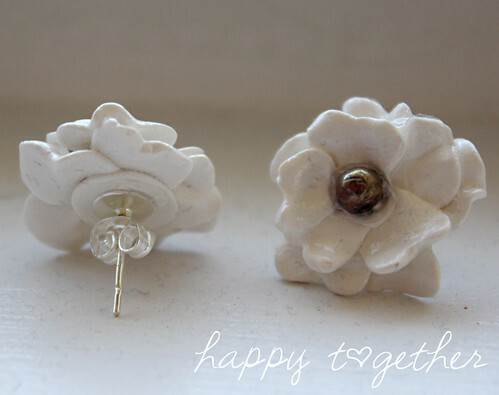 Hi I have just started to have a go with polymerclay, I have really enjoyed your project and great easy instructions . I am going to have a go myself tomorrow .Thank you .Do you have any other ideals.